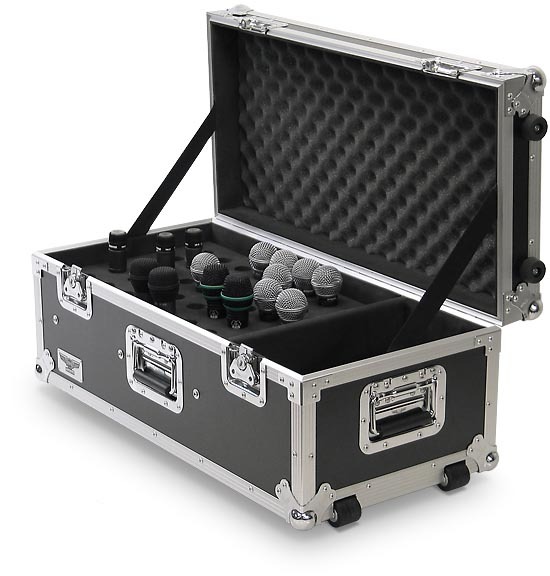 This is the EWI Tourcase tm Model M040-30MM, 40 mic road case with DI compartment. The 40 mic holes are 30MM in size and will accommodate a variety of microphones. The side panels are constructed with 3/8" hardwood plywood covered with a black ABS laminate finish. The extrusion is all aluminum and the interior is fully padded. 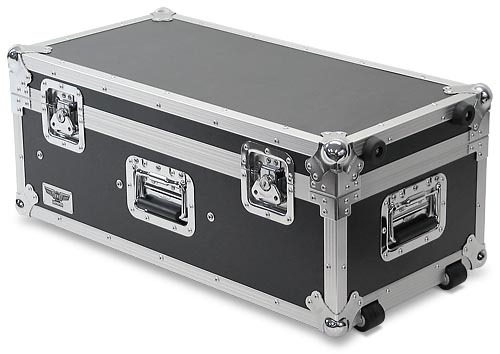 The case is assembled with high quality aluminum rivets with the rivets on the 3 recessed padded flip handles backed by washers to ensure strength and durability. The lid is hinged on the back and held closed with 2 butterfly latches. Each corner is protected by a large ball corner and the case sits on 4 rubberized feet. There are two small bogie wheels on the right bottom to facilitate easy transportation. To the right of the mic compartment is the separate compartment for DI boxes, mic cables, mic clips or similar items. Also, below the removable mic caddy tray is possibly more room for stuff. 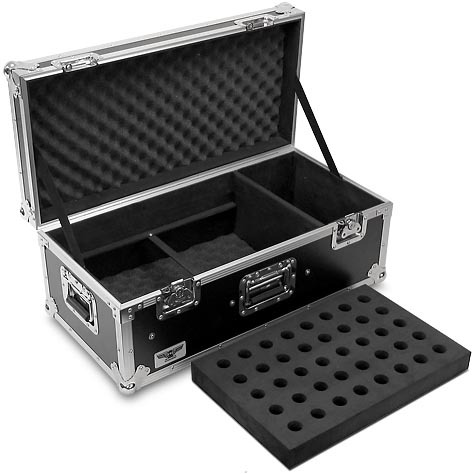 Road case for microphones and DI boxes. Depth of trunk bottom interior: 8 1/4"
Height of lid interior: 2 3/8" with foam somewhat compressed. Over-all interior maximum height capacity including lid with top and bottom foam somewhat compressed 10 1/2"
Dimensional shipping weight: 50 lbs.